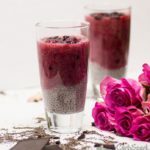 A Raspberry Vanilla Chia pudding is perfect for a romantic yet healthy keto breakfast recipe that is nutrient-dense and loaded with antioxidants, fiber and omega-3s. Celebrate love with a festive healthy dessert, that is very low in carbs. One serving provides only 2g NET carbohydrates, making it perfect to serve on a keto diet. It’s also dairy-free because I’m using coconut products such as coconut cream and coconut milk. Make sure to get the unsweetened ones because out on the market most of the foods are loaded with sugar and labelled as healthy. The sad truth is that sugar comes under at least 61 different names. I use chia seeds as part of my diet because they give me energy, endurance and have 100% more omega-3 fatty acids than salmon. Omega-3s are good for heart health, regulate cholesterol, lower high blood pressure, reduce inflammation and improve many other health conditions. The key point in a ketogenic diet is to reduce inflammation. Studies show that inflammation is at the root of many diseases. 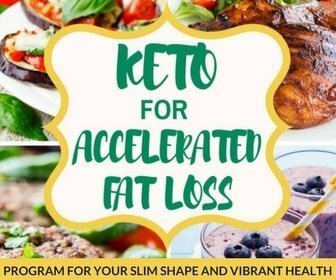 Craving sweets and chocolate on a ketogenic diet? Add cocoa powder and keto approved sweetener, coconut flakes to the plain chia pudding and you will get a decadent chocolaty low carb dessert or a perfect low carb snack. 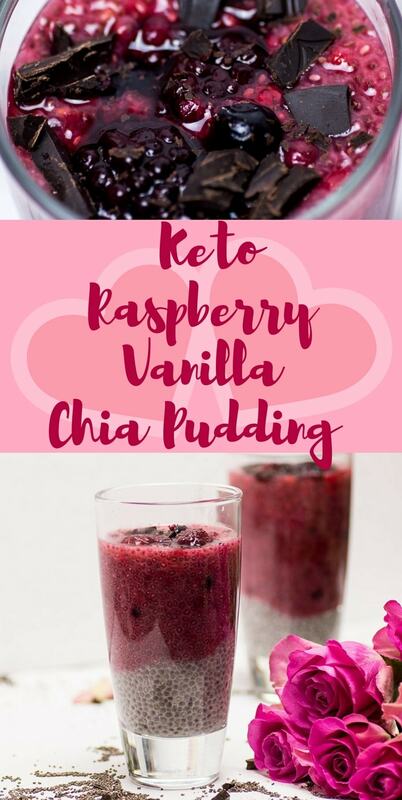 PS: You can enjoy a huge dairy-free chocolate chia pudding in my Keto for Accelerated Fat Loss Program that comes with all the tools you need to succeed with the keto diet. Mix all the ingredients but the berries and then wait at least 2 hours. Give the chia seeds enough time to do their magic, soak up all the liquid and turn into a delicious pudding. 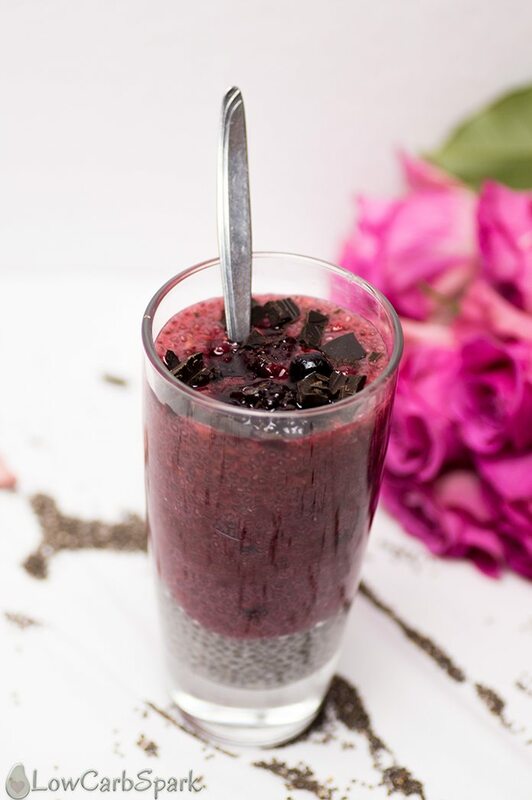 With a fork turn the berries into a paste and then mix with half of the white chia pudding. Pour one layer of the white chia pudding, and one of the red chia pudding. Decorate with fresh or frozen fruits and serve! If you make this recipe make sure you let me know how it turned out in the comments below or on Instagram @lowcarbspark. A festive, yet super simple way to celebrate love and special days. 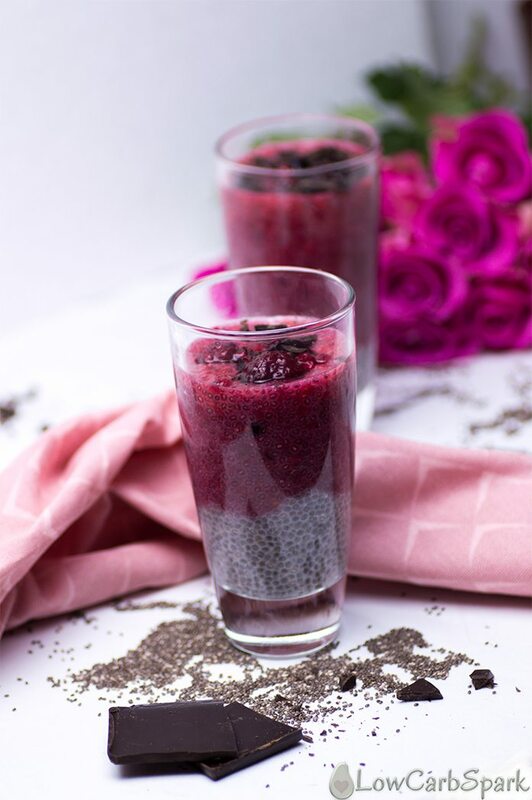 The Raspberry Vanilla Chia pudding is full in antioxidants, fiber, calcium and rich in nutrients. Keep the macros inline with this delicious treat. Also perfect for a high-fat vegan, vegetarian, gluten-free and dairy-free diet. In a large bowl mix all the ingredients except the berries. Let it rest for at least 2 hours. 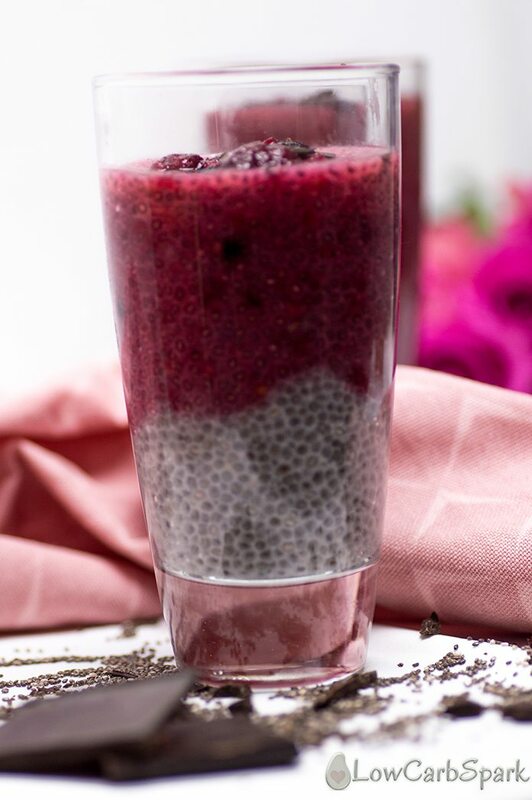 Spoon half the vanilla chia pudding into 2 glasses or serving bowls. Mash the raspberries with a fork to form a puree. Mix the remaining chia pudding with the puree. Add the red chia pudding layer over the white one. Top with more berries and dark chocolate chips. You can divide the chia pudding in more servings if you desire. The nutrition facts are for 2 servings. Each keto chia pudding serving has 2 NET carbs.